Mason Dixon KAL: Hello everyone! They made the not-much-loved chore a more pleasant one! Now the question. 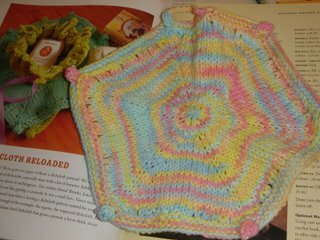 I have been dying to get those potholder loops as seen in the book. However, it seems that I couldn't find them anywhere. Can anyone tell me where I can find these in California? I've been to Jo-Ann and Beverley but couldn't see any. Which section of the stores should I look? I'd love to make those colourful rugs from the book. Thanks a lot. I saw some yesterday at Joann's in the kids section - they had "refill packs" for the pot holder looms. Good luck! I've saw big bags of them at the Cracker Barrell restaurant/store. Both have a bunch of colors. I just googled "pot Holder Loom" and a bunch of sites came up with the loom and the supplies. If these are indeed what you are asking about! Potholder loops can be bought for $1 a bag from Harrisville. Go to http://www.harrisville.com/html/deals_steals.html and look for the recycled cotton craft potholder loops. The Harrisville loops are the Cadillac of loops, and they're just great. They make them especially for weaving on potholder looms, so they're never too short as happens with the loops that are made from the actual leftovers of sock manufacturing. But Harrisville's are more expensive. For rug making, I think any cotton loops work well, because it doesn't matter whether the loops are small or large. Cotton or wool? 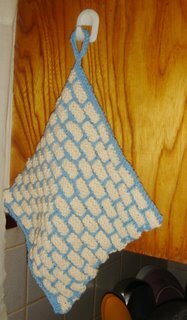 We used the cotton ones for the potholder loop rug that's featured in the book. But the wool ones are really spongy and nice. I didn't wash that rug, though, so I don't know what happens when it's time to clean a wool potholder loop rug. Thanks so much ann- I was probably overthinking this, cotton or wool? Argh! I just can't wait to crank out the rug.